Welcome to the online home of Dyna Staffs. 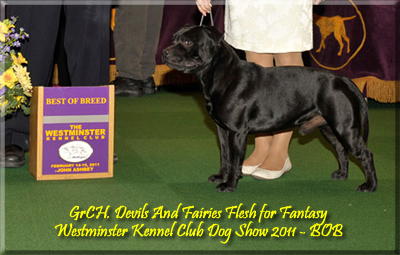 We are breeders of Championship Staffordshire Bull Terriers. We strive to maintain the breed standard including type, and temperament. Our Foundation Staffords were imported from Europe, primarily from England. Our dogs are health tested, results are available upon request. Feel free to browse around and if we may assist you, please contact us. Also, please find, and like us on Facebook. Please go to our puppies page for why we will NOT breed for blues! appearance to the much larger, American Staffordshire Terrier. The Stafford should be a stocky dog, with a muscular build, and athletic ability. They have a broad head, and relatively short muzzle, dark round eyes, and a wide mouth with a clean scissor-like bite. The ears are small. The cheek muscles are very pronounced. Due to it's breeding, the Stafford is known for its character of great courage, high level of intelligence, and tenacity. This, coupled with its affection for its friends, children in particular, its off-duty quietness and trustworthy stability, make it the foremost all-purpose dog. It has been said,"No breed is more loving with its family." a.k.a. "Nanny Dog." AKC Breed Standard, UKC Breed StandardAll dogs represented on this site are owned by Dyna Staff Partners, unless a co owner is otherwise specified. When placing a deposit or purchasing a pup, please know our contract and expectations of Dyna Staffs thoroughly.